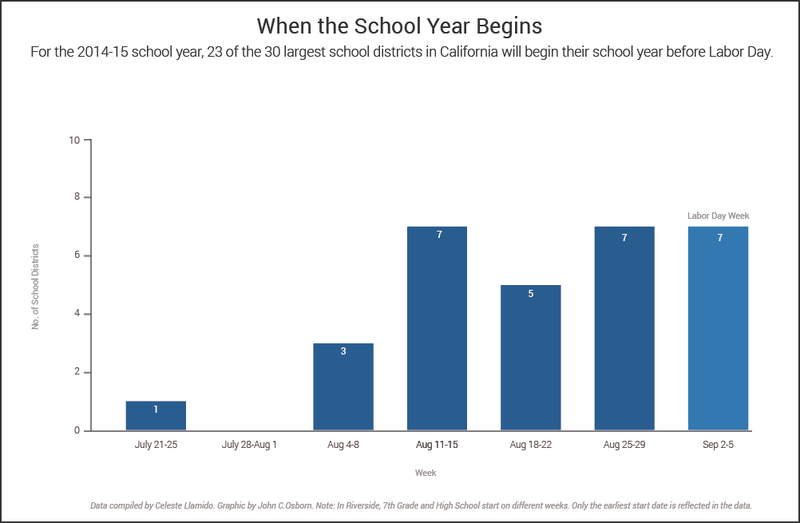 For millions of California children attending schools in the 30 largest districts in the state, summertime is back-to-school time. An EdSource survey of the 30 largest districts and most of the largest charter school operators in the state revealed that all started school by Aug. 31. That includes seven that in a 2014 survey began school in September but by this year shifted to August. This year, three districts started in July, while 27 started in August, including 14 that began school in the last two weeks of August. The 30 largest districts educate about a third of the state’s more than 6 million students. In 2014, only one of the 30 largest districts started in July, 22 started in August and seven started after Labor Day, including Santa Ana in Orange County, which pushed the calendar up by two weeks to August 14 starting this year. Students will get out May 31, nearly a month earlier than in past years. The shift allows students to enroll in enrichment programs and college courses, and begin working summer jobs and internships earlier, said spokeswoman Deidra Powell. “A lot of times companies will go with the students who are available,” she said. The district also shortened the winter break from three weeks to two out of concern that some students would go hungry without school breakfast and lunch and that parents with inflexible schedules would not be able to afford childcare. Officials at several districts and charters said they had solid academic reasons for starting school before Labor Day. A school year beginning in the middle of August means students can complete their fall finals before the start of winter break and receive more preparation for state standardized tests in the spring. High school students have more time to prepare for college-entrance exams. The trade-off for these earlier start times is often longer breaks during the year, an earlier end of the school year, or both. But the end of summer vacation before Labor Day — which many parents fondly recall as their last hurrah as they turned their attention back to their studies — doesn’t sit well in some communities. In fact, backlash against sending kids to classrooms in the scorching summer heat was so fierce in San Juan Unified near Sacramento that the district invited the community to voice its concerns about the calendar in an online poll. More than 1,200 people rallied against the district’s Aug. 10 start date, with many arguing students should start the school year closer to September. Fresno Unified, on the other hand, wants to ensure that the district’s many immigrant families who travel back to Latin America during the winter break can enjoy a three-week vacation, said district spokesman Miguel Arias, adding that district schools have been on this schedule for at least two decades. And while some critics of earlier start times say districts could save on utility costs by kicking off the academic year after Labor Day, the savings would be minimal for Fresno, Arias said, because a third to a half of the school campuses are open anyway for summer learning or community outreach purposes during the summer — including access to school swimming pools for the public. The California School Boards Association doesn’t compile start dates and doesn’t make recommendations on the issue. “Our position is that school schedules should be a matter of local control as those closest to the communities are best equipped to make decisions that meet their schools’ unique needs,” said spokesman Troy Flint. 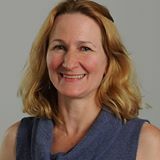 Los Angeles Unified, the state’s largest district, began moving its school start date from September to August after several high school principals lobbied the district in 2009, said Zsuzsanna Vincze, director of the division of district operations. Like a lot of districts, Los Angeles Unified in 2012 opted for the earlier start in part so students could finish the first semester before winter break, she said. The earlier start also allows students more time to study for Advanced Placement tests given in the spring, and for the PSAT, which is administered in the fall, she added. But not all parents and school leaders are happy with the shift to an earlier start date, said Derrick Chau, the district’s senior executive director of instruction. He said some parents and faculty have asked why elementary and middle students have to accommodate the interests of high schoolers. School Board President Ref Rodriguez is in favor of having two calendars — one for secondary schools and one for elementary schools. “I believe our district can innovatively provide an option that is not simply a one-size-fits-all approach and is actually more responsive to what we’ve heard on the ground,” he said in January before becoming president. Some of the largest charter school operators in the state, including Aspire Public Schools and KIPP LA, try to sync up their schedules with those of neighboring school districts. One operator said they have seen higher rates of absenteeism when neighboring districts are off and they are in session. 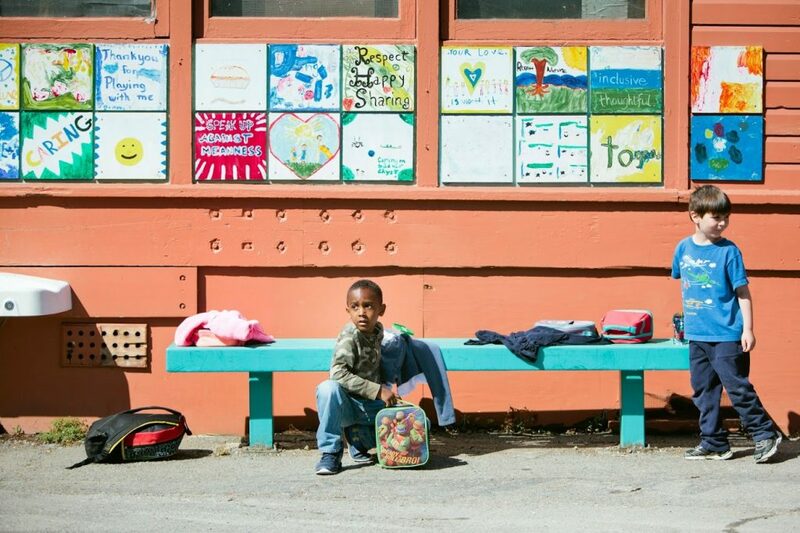 KIPP schools in San Francisco and San Diego start at least a week earlier than neighboring district schools due to a summer school program, which extends their school years. Other large districts offer year-round schedules, meaning some students start the school year days after that other summer holiday — Independence Day. Corona-Norco Unified in Riverside County has been starting in August or earlier for decades as a way to deal with overcrowding. Until recently, the district had all of its schools on year-round calendars. This year, five schools have different start dates based on four different year-round tracks, said Glen Gonsalves, the district’s assistant superintendent. Students still get the same amount of vacation time, it’s just broken out across the school year rather than a lump sum of dates in the summer. For example, students in the ’A’ track start in July and go for three months, get October off, go for another three months, then get the next month off. “So essentially one-fourth of the student population that goes to that school is not at that school site in any one month,” he said, explaining that the site can accommodate more students that way. Elk Grove has the most complex schedule, with four different year-round “tracks,” a modified schedule and a traditional schedule — all in place for more than two decades to accommodate rapid enrollment growth, said Xanthi Pinkerton, communications director. High school students in Lodi Unified in San Joaquin County have been starting school in July according to a “modified traditional” schedule since the early 1990s, while elementary and middle schools were on a year-round schedule, said Dawn Vetica, assistant superintendent for secondary services. The district switched all schools to the modified schedule by the early 2000s, “as soon as we were able to build enough schools and have the classroom space for all of our students,” she said. This story was updated Sept. 5 to clarify KIPP charter school schedules. There has been much debate down here in San Diego Unified as to whether starting earlier (before Labor Day) is better. Many of the “reasons” listed here have been presented as rationale to start earlier, but no data has been presented to corroborate the rationale. For example, is there any data from any of the districts in California (or nationally) that demonstrate that student outcomes improved (e.g. performance on AP exams or PSAT) when the school year started earlier? Were stakeholders – students, families, teachers, etc. – consulted before the school year was moved earlier, or was this an executive decision by those who profess to know what is best for students and their families? Every time stakeholders in San Diego Unified are polled about school start dates, the majority prefer starting after Labor Day, with excessive heat as one major factor cited. However, the superintendent and school board trustees routinely ignore the stakeholders – and ignored even the most recent recommendation of the district’s calendar committee – and choose to begin the school year before Labor Day. Due to high temperatures last week, minimum days were scheduled for more than a third of the districts schools, sending thousands of students home early, resulting in loss of instructional hours and causing lost productivity (and income) for working parents. This leaves many questioning the wisdom of starting the school year earlier. For the second consecutive year, San Diego Unified has started school the last week of August for K-12 students, even though results of community-wide polling showed a preference for beginning the day after Labor Day. One of the results of this autocratic folly is the district having had to call two half-days this week because of stifling heat.